We have four gardens, an orchard, a vineyard, and a native plant pollinator garden at the Cable Community Farm. The Community Garden provides garden space for members of our community at the Cable Community Farm. The garden space is fenced with access to water and a supportive community of gardeners. There are three size plots available to rent for the growing season: 10 X 30 ($20), 30 X 30 ($30), and 30 X 60 ($40). To request a plot, complete a 2017-garden-plot-application and mail it, along with a check, to the Cable Community Farm, 13765 Perry Lake Road, Cable, WI 54821. Questions? Contact Cec Peterson, the Community Garden Coordinator. The Growing Together Garden is adjacent to the Community Garden. It is where volunteers grow produce for the Cable Area Food Shelf and Free Food Mondays. Open Garden times are Sundays from 4:00 to 6:00pm during the growing season. Volunteers prepare the garden space for planting, plant, weed, water, harvest,and clean up. In 2016, we donated over 1,300 pounds of produce to households in our community! The Downtown Garden is located on Spruce Street, a lot behind the Fogarty Medical Clinic and acres the street from the Chequamegon Fat Tire office, downtown Cable. This garden space contains six raised beds for residents in the downtown Cable area. Beds are $5 for the growing season. Mentors provide gardening support for new gardeners on a regular basis. The Theatre Flowers Garden, located at the Cable Community Farm, is where we grow flowers for the Chequamegon Children’s Theater, a nonprofit organization that puts on a theatrical production every summer. All children, ages 7 to 18, who audition get a part and there is no charge for participation. The Community Orchard was planted in the spring of 2103 thanks to a donation from Xcel Energy for the trees and the help of a group of volunteers. We have thirty-five fruit trees, including apple, pear, plum,and cherry. We envision this space as one that will provide a source of fruit to donate to the Cable Area Food Shelf and for community events. The Community Vineyard was planted in 2015 thanks to a donation from community members, Tom and Amy Nigbor, who gave a set of grape vines to the farm. The vines are cold-hardy varieties developed by the University of Minnesota. Eventually, we will be able to use the grapes for making jelly or wine! The Native Plant Pollinator Garden was planted in 2015 thanks to a grant from the C. G. Besadny Conservation Program and help from Sarah Boles, native plant expert. Community volunteers planted the garden and now it will attract beneficial pollinators to improve the yields in our other garden spaces! Questions? 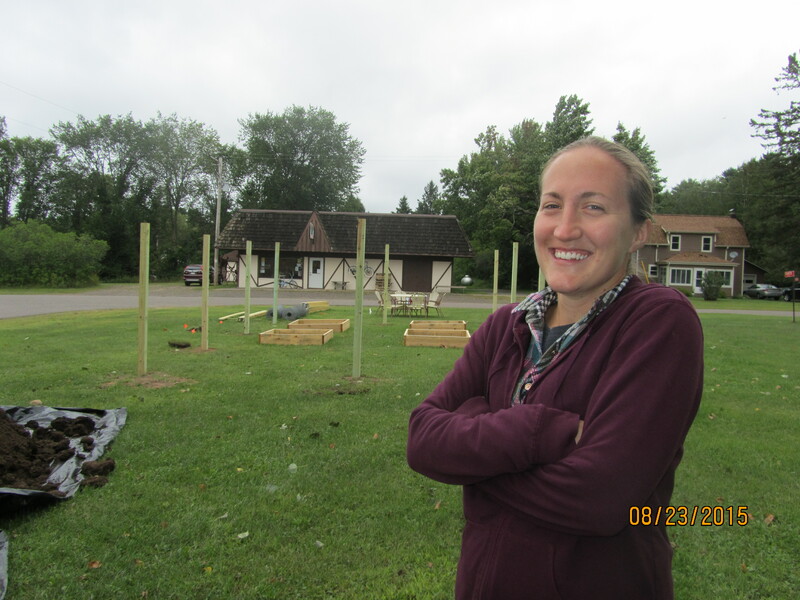 Contact Katie Hancock at 715-798-5244 or katie@cablecommunityfarm.org.